Ironically, Vice President Mike Pence was delivering his message of harmony on the day that Ahok, the Christian governor of Jakarta, was ousted in a heated election marked by violent Islamist demonstrations. Pence's assertion that "religion unifies" might, in fact, have been interpreted by those who voted for the candidate favored by militant Muslims to replace Ahok, to mean that the Trump administration was giving a stamp of approval for Islam to serve that role exclusively. The Trump administration and the rest of the West needs to pay closer attention to what is going on in Indonesia: its future as a tolerant democracy is being rapidly threatened by a strengthening Islamist presence. When U.S. Vice President Mike Pence arrived in Indonesia on the night of April 19 for his first state visit abroad, he clearly did not intend for his positive gestures and kind words to be construed as controversial by the very people at whom they were aimed. "In your nation, as in mine, religion unifies, it doesn't divide," Pence said to Indonesian President Joko Widodo the following morning at the Jakarta Palace. Pence lauded Indonesia, the largest Muslim-majority country, for "its tradition of moderate Islam," which he called "an inspiration to the world." He also toured the Istiqlal Mosque, designed by North Sumatran Christian architect Frederich Silaban for Indonesia's first president, Sukarno, who insisted it be built near the Jakarta Cathedral and Immanuel Church as a symbol of religious harmony. Ironically, Pence was delivering his message of harmony -- to allay concerns in Indonesia over what was perceived as the Trump administration's anti-Muslim rhetoric and stress strategic, political and economic ties -- on the day that the Christian governor of Jakarta was ousted in a heated election marked by violent Islamist demonstrations. While millions of supporters of Governor Basuki Tjahaja Purnama, familiarly known as Ahok, were mourning the defeat of their candidate -- tried for blasphemy against Islam and found guilty on May 10 -- Pence was pointing to the "common values [of] freedom, rule of law, human rights and religious diversity" shared by the United States and Indonesia. Under other circumstances, such a statement from the U.S. vice president might have been uplifting to the moderates behind Ahok, who is not only a Christian, but ethnically Chinese. However, due to the victory of the radical Muslims decrying the incumbency of a Christian on the grounds that the Quran forbids it, Pence's timing was problematic. His assertion that "religion unifies" might, in fact, have been interpreted by those who voted for former Education Minister Anies Baswedan, the candidate favored by militant Muslims to replace Ahok, to mean that the Trump administration was giving a stamp of approval for Islam to serve that role exclusively. "That Pence should be saying this after the most divisive and sectarian election in Indonesian history is flabbergasting," Australian National University associate professor Greg Fealy said. The outcome of the Jakarta gubernatorial election that day was the result of a hate-campaign waged against the very pluralistic ideals that Pence was praising. As a paternalistic society, Indonesia has a public that can be easily manipulated by its leaders. When Indonesia's leaders include hardline clerics backed by scholars who insist that Muslims, by virtue of Quranic decree, must have all the power, unity is elusive, both in theory and in practice. Jacobus E. Lato is a writer based in Surabaya, Indonesia. Indonesia was once a peaceful Buddhist country. What happened? The Buddhists didn't secure the borders and let the Muslims in! Australia where I live has secure maritime borders but the Government is still importing Muslims (read problems) at a break neck pace. If this continues Australia over time become another Islamic country courtesy of our gutless Governments! While Pence seems to be assenting to the Indonesian problem, it would be most likely, as asserted, an attempt to defuse perceived anti-Islamic rhetoric. But the evil side of me, prompted by the rise of anti-Caucasian, anti-Christian and anti-Chinese sentiment in Indonesia, thinks of a more sinister option. Let Indonesia collapse under the weight of Islamic incompetence, and let the murder of the ethnic Chinese promote a China-led response. In Australia, there are only a few voices supporting Indonesia, and those for commercial reasons (such as the live beef trade, exporting Brahmin cattle to the only country that will accept them). Israel should carry on exactly as it is doing. The refusal to recognise Israel and refuse any sort of settlement where Israel exists is a disgrace. I take comfort from the fact that Israel has a no nonsense approach to all these problems and knows exactly what to do when the needs arise. I frankly, found it astonishing when Pence was visiting my country (Australia) recently, that he made a statement about how Indonesia is a model moderate Muslim nation and should be held up as a good example. Uh, has he actually been to the Aceh province? Because I have, several times. The sole reason why Indonesia has not become an Islamic republic is because Wahhabism has not yet become dominant there. And that is rapidly changing. The Saudi King just visited Indonesia for pete's sake, dragging who knows how many servants and gold plated objects and fancy cars to be driven around in (the Saudi's really don't have any class when it comes to displaying wealth). The Saudi's are pumping huge amounts of cold hard Wahhabist cash into Indonesia, they are rapidly building mosque's, schools and universities. They are funding Imam's. Indonesia ALREADY has a known terror problem, ask any Australian about the Bali bombings, where so many of us lost our lives in a nightclub on a party island because of Islam. Indonesia is a democracy in name only as it is now. It will rapidly disintegrate into becoming an Islamic Republic, probably within the next 5-10 years. 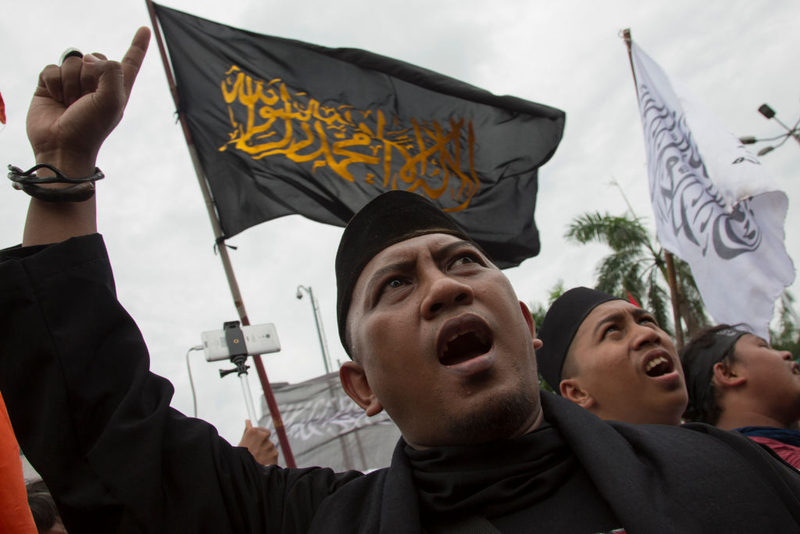 The Americans are bizarrely ignorant if they think that Indonesia is a model of moderate Islam. I doubt that Pence knows much about Islam, or how virulent it's becoming in Indonesia, or would care if he did know. These speeches are written to conform to, or promote some political agenda -- Pence hits the marks and says the words, like any other actor. The public face of politics is generally a fraud -- what they are actually doing is seldom revealed to the public. Pence is there for a reason, but not to notice, or comment on Islamic intolerance, if he is aware of it. When is the West going to take these hardline Islamists seriously - and deal with them? The civilized world appears to have lost its collective mind with regard to what Islamists say - and what they do. When are we going to hold Islamic countries to decent, humane standards? When are we going to stop pretending that Islamic countries are either humane or civilized in their treatment of all who come under their malevolent glance? The number of non Muslim citizens who have been imprisoned - like Ahok, for racist reasons, and the numbers of (mainly Christians) who have been slaughtered in the. Middle East has risen to almost one hundred thousand. We cannot and should not close our eyes to this outrage. We in the West are currently playing ( and paying) host to countless messengers of the very same ideology so prevalent in Indonesia. That these newly arrived - many, but not all, bear great antipathy for western democracies and religions can be clearly heard in their oft repeated promises of establishing a caliphate- with or without our compliance. For doubters who read this, examine the success, culture and traditions of every country in the Middle East, and then ask yourselves, is this really what you will stand by and see replicated in your town, city or country? Indonesia, democratic country with the largest Muslim population of about 203 million. Now, imagine, they become militant. This fact and Indonesia's geographical location will boost the strength of Jihadists. Scary! We are worried. Really worried. They are literally a dinghy ride away. We have a population of around 24 million. They have 203 million and rapidly rising. We have vast unused space and far better standards of living, they are crammed in on top of each other and living in 3rd world standards. Its not going to go well for us, if they turn full nutty. We're going to need the Americans more than ever when that day inevitably comes. People wonder why we align so closely with the US and side with them in everything. How could we not? They are a safeguard for us, to hold back types like the Indonesians.